In the early 1940s, Allen Ginsberg is an English major at Columbia University, only to learn more than he bargained for. Dissatisfied by the orthodox attitudes of the school, Allen finds himself drawn to iconoclastic colleagues like Lucien Carr, William S. Burroughs and Jack Kerouac. Together, this gang would explore bold new literary ideas that would challenge the sensibilities of their time as the future Beat Generation. However, for all their creativity, their very appetites and choices lead to more serious transgressions that would mark their lives fore ver. After watching a few blockbusters I always get the urge to put on a not so commercial film. 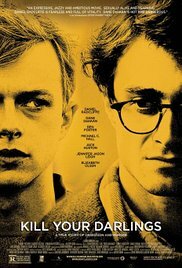 The title of this one combined with the fact that I’m not a real expert in literature, made ​​sure that my expectations about “Kill your darlings” were totally misjudged. The phrase “Kill your darlings” is used in literary circles and is a maxim for writers and poets to delete favorite wordings, adjectives or phrases so that their writings become tighter and not defiled with unnecessary ballast. So you can expect to hear a lot of intellectual posturing in this film. It’s actually a biographical drama about the origins of the “beat generation” in America and the young adults who support this : Allen Ginsburg, Jack Kerouac and William Burroughs. All of them became renowned writers and poets afterwards. I also was an avid bookworm in the past and I devoured innumerable books. I wasn’t a fan of the literature with a capital L, but rather took pleasure in reading books written by Jack Vance, Raymond Elias Feist, Terry Pratchett, Terry Goodkind and Koontz among others. Not exactly literary heavyweights but masters of the fantasy and SF genre. My intellectual level probably wasn’t of such a nature that I could appreciate magical realism, expressionism or neo-romanticism. Just as modern art, I think it means, describing the most trivial objects in such way, that they become fascinating objects. At one stage Allen, William and Lucien shred some books from great writers in pieces, and text fragments are nailed to the wall so they can form a coherent whole. A creation of literature out of chaos as it were. However I can empathize with the mood of the characters involved. I myself was also such a rebel once and didn’t have the attitude of walking within the lines. Ultimately, you can see these beatniks as early forerunners of an anarchist movement in literature. Kicking the standardized writers who abide all elitist rules and styles in the shins. The film is set in the aftermath of the 2nd World War, which is reflected in the whole atmosphere : the decor, the props, the music and the zeitgeist. This is also the most successful item in this film directed by John Krokidas. His first feature film he surely can be proud of and in which he succeeds in portraying the feeling of that time. You are witnessing the tipping point in the prudish American society where the youth of that time was looking for new trends and creative outlets. This manifested itself in dank little pubs where they played jazz, pseudo intellectual gatherings where gallons of alcohol was being consumed, experimenting with all kinds of mind-altering drugs and scanning the sexual boundaries and tolerances in this area. The performances were all sublime. Dane DeHaan as the extrovert and intellectual Lucien Carr, the pivotal figure in this whole drama, who does look like a gay, blue-eyed blonde charmer, but reflects a genuine uncertainty about his sexual orientation. Michael “Dexter” Hall, who recently starred in “Cold in July“, plays a homosexual stalker who sinks to the bottom of some pond in the beginning of the film. Jack Huston as Jack Kerouac. Ben Foster as William Burroughs. An intellectual who comes from a wealthy family, who’s constantly experimenting with all sorts of drugs and therefore speaks in slow motion with a deep, rough voice the entire movie. And Daniel “Harry” Radcliffe as Allen Ginsberg. Radcliffe really does some effort to finally wipe that “Potter” stamp away. I have to admit that he plays in this film with very different magic wands. And yet I admire him for not giving in and choosing the obvious roles. After his not so bad performance in “The woman in black” he’s now trying a more serious role with some fairly bold homosexual scenes. I’m still wondering about his sexual orientation now. The passion he shows while kissing his male opponents speaks volumes. And despite his efforts, once and a while that “Harry Potter”-smile that made him famous, appears again. After he sees the act of Carr in the school library you can admire that boyish roguish smile. The only thing missing is that twinkle in his eyes. Not a bad performance, but at times it was really superficial and it seemed more like a Shakespearean tragedy. A difficult film. And despite its boring subject, it continued to fascinate me. A crime drama without that much drama. A passion that leads to a crime, but it’s certainly not the emphasis. It’s rather a film full of philosophical musings and constant literary debating by those who’ll be the greatest in literature. All this with a solid bottle of wine and glass of whiskey after a hearty sniff of nitrous oxide. At times I also wished I had that in reach so this film would be more light-hearted. But still, respect for Radcliffe.